Do you want to add outdoor lighting to the exterior of your home? Perhaps you have a few rough ideas of how it would look or what you could do with the lights, but you're not sure? Maybe you are not sure where to start and need more ideas? American National Sprinkler & Lighting can help you develop your own ideas and concepts to give you a beautiful lit home and landscape. 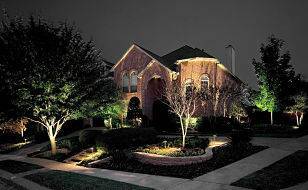 Our team can then help you execute your outdoor lighting vision! 1. Attention Grabbing: Outdoor landscape lighting can be used to create attention grabbing displays. For example, if you have a nice outdoor area that you want people to be able to see even when they're not right next to it, but rather driving down the street, you can use the outdoor lighting up the are and make it look extravagant. 2. Boundaries: Exterior landscape outdoor lighting can be used for boundary markings. Say you have a patio or deck that is elevated, maybe slightly, but does not have a railing, you can use the lighting to create a "railing" so guests know where the edge of the area is. This will not only make you feel safer about your outdoor entertaining area, but will also make it look great and stylish. You could also use it to mark you driveway or property lines. 3. Gardens: Gardens always look so wonderful in the spring, summer, and even fall. But, the problem is that the sun sets. Your garden isn't visible at night. You can install landscape outdoor lighting to shine on your garden so it is visible at night and can still be appreciated and wow'd over even after sunset. You put out a lot of work into your garden and you should be to show it off for more than 12 hours a day. 4. Trees: Trees are great for making your outdoor area look tall and add variety; using exterior lighting can make your trees transform from just another piece of the garden to a focal point! You can use the lights to uplight the tree(s) and make it look like something to be admired. 5. Your House: Use the exterior lighting to uplight, downlight, or even both. Using the lighting on the outside of your home can show off your magnificent home, no matter what size, and allow people to be wow'd while driving or walking down the street, prevent crime from happening on your property, or just add style. 6. Moonlight: This is an idea that is still catching on, but is a great idea. Using landscape lighting to create a style of moonlight is great. You can do warm and/or cool lighting to create a welcoming, relaxing environment on your property. One idea is put the lights high in trees to create a natural moonlit look and a unique one at that. At American National Sprinkler & Lighting, we look forward to working with you in highlighting your home and landscape area. We can help you develop your own ideas and concepts and turn them into reality with our lighting experts. If you have any comments or questions, please call us at (847) 566-0099 or schedule a free quote today!